Is it Friday yet? I know we just had a long weekend but I'm already looking forward to the next one. We finally opened up our cottage for the season and I cannot wait to get back. Surprisingly, we were productive for the first weekend and have already checked a project off our To Do list! Come have a look. Welcome to our dining room. 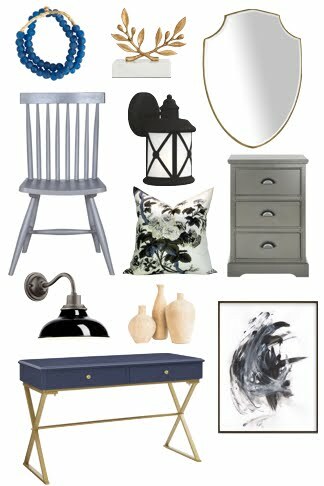 This being our third season at the cottage, we're at the point where can start adding in layers and focusing on decorating, as many of the big DIY projects have been completed. And to me, that means transforming this place from a builder's basic to a real country escape. How do you style a unique and memorable room? With drapery. Early on, we realized how much we loved spending time here so we decided we would rarely rent out our cottage and then only to family and friends. That has afforded me a certain freedom now with the decorating. I'm decorating for longevity and catering to our family and our tastes - bring on all the country florals and gingham and plaid fabrics, I say! 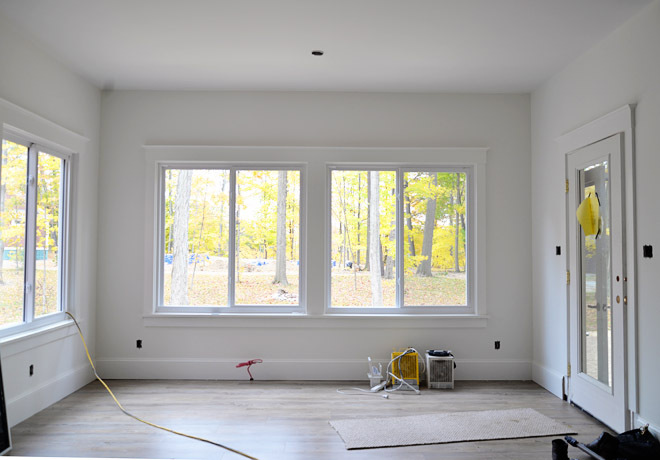 To me, there is no better way to add instant personality to a space than with window coverings. 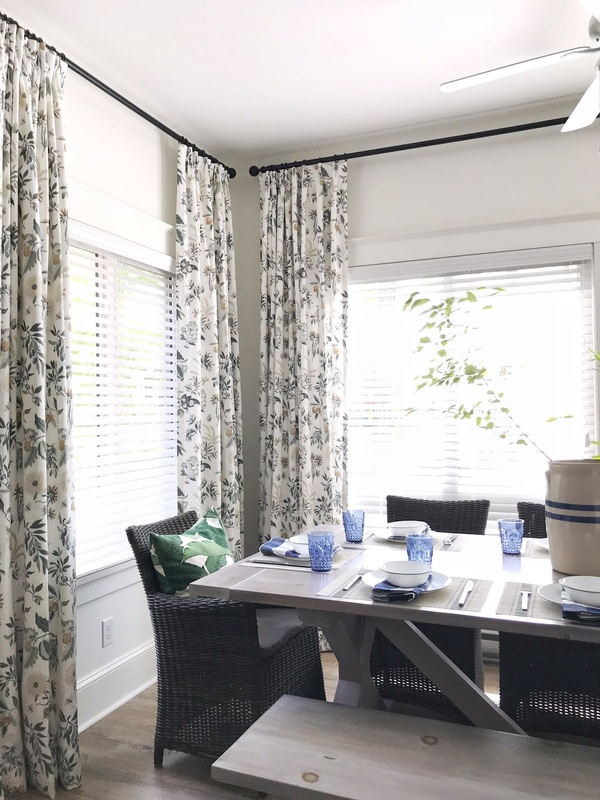 The cottage walls are painted white and I knew that curtains would help define this space. Sadly, I didn't take any Before photos but here's what the dining area looked like during construction. 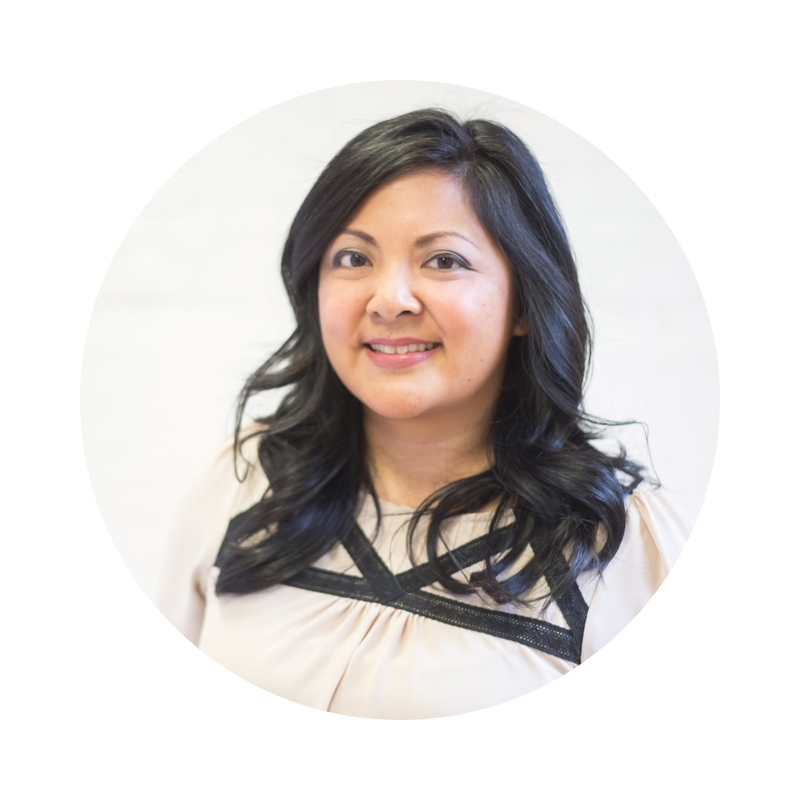 I reached out to my friends at Fabricut to see if they wanted to partner on this project. I had previously worked with Fabricut on our One Room Challenge Preppy Trad Living Room. 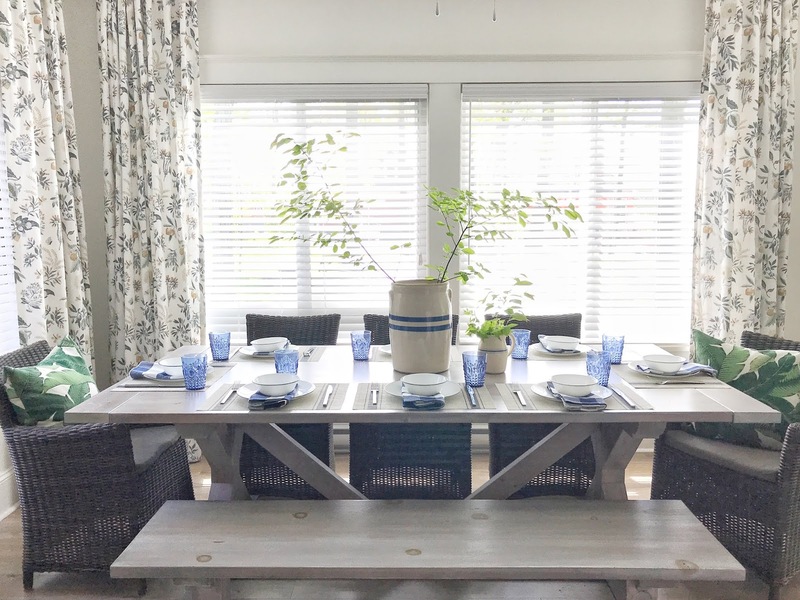 They provided the gorgeous cream plaid fabric for the window seat and the stunning blue fabric that completely transformed our old yellow armchairs. Fabricut has thousands of fabrics available to the design trade and I had no doubt they would have something perfect for this room. For these windows, I was looking for a fabric with a medium size pattern. Something casual and textured and not too busy or bold. I wanted an off-white base colour as I thought pure white would feel too modern. These samples above were all very lovely but ultimately we chose the Fleur Botanical La Mer. I can't even tell you how much I love love love this fabric. 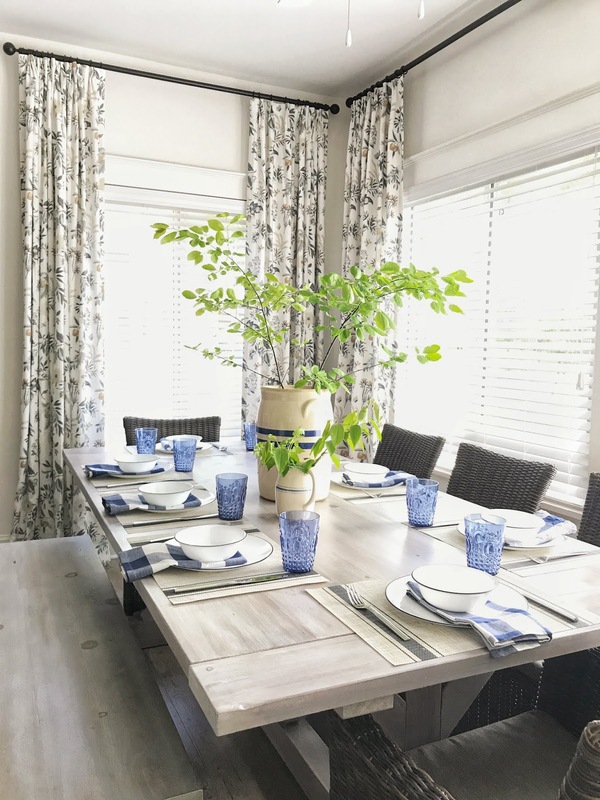 The texture, the whimsical flowers and butterflies and caterpillars, the sophisticated palette of deep blue-greens, aqua, and coppery orange... it is the perfect blend of modern + country. To give this dining room some drama, we've taken the drapery as high as we can go on these 9' walls and used black hardware to ground the look. All the hardware and the sewing of the drapery was done by my favourite, Tonic Living. 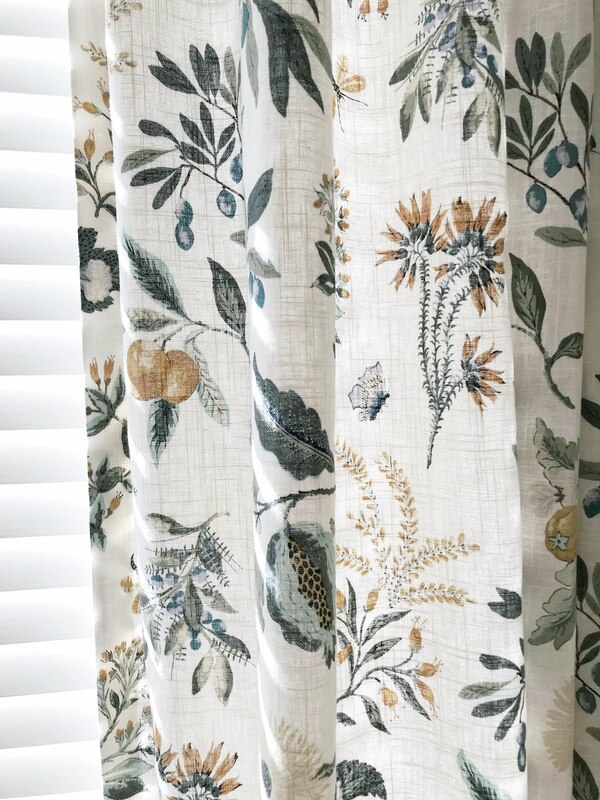 The drapery panels are decorative (meaning they aren't meant to be drawn and won't cover the full window) but they add needed texture and pattern. 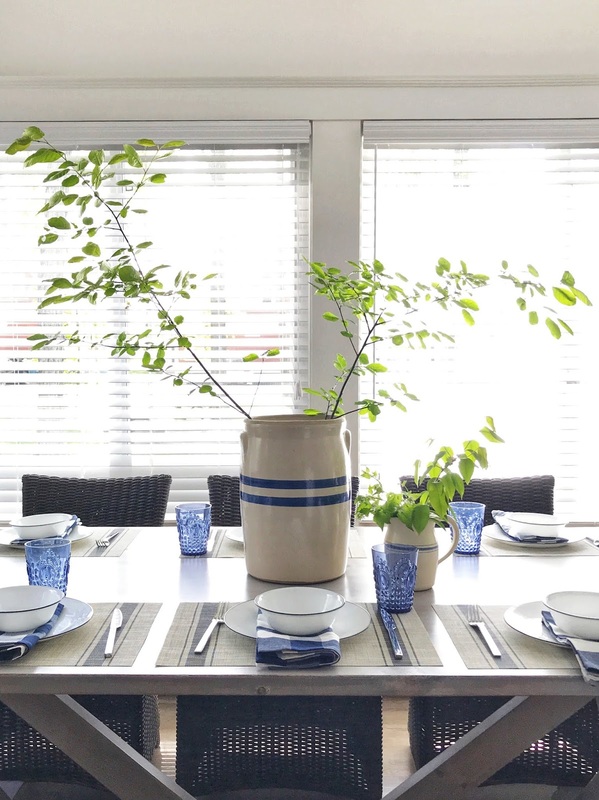 I love how the mid tone greens and blues work with the grey tones of the dining table (made by Chris!) and the flooring. But the real magic is in the tension... the rustic table and woven chairs vs the detailed hand-drawn quality of the fabric. 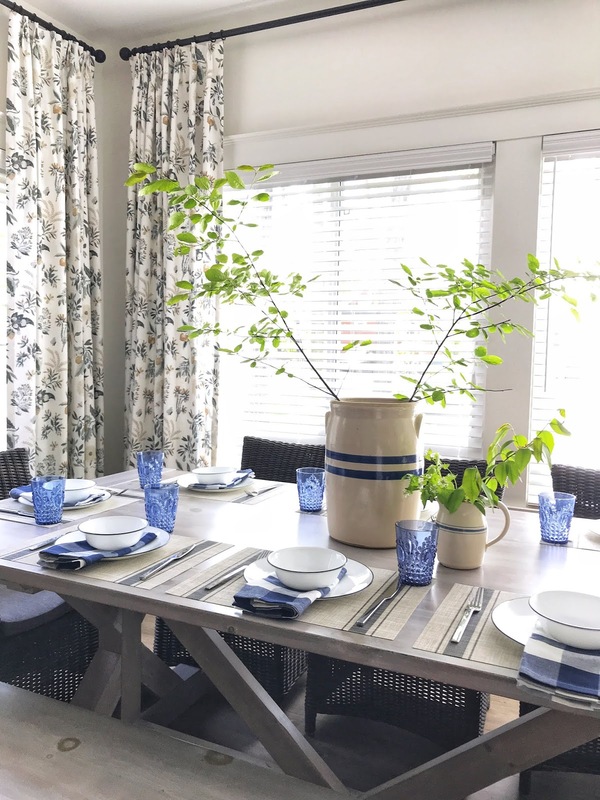 The vibrant pops of blue on the table and green palms pillows against the more muted backdrop. I love trying to find that balance. But there's more to see... let's head over to the kitchen. Clearly, I love plaids. This side of the cottage is all about mixing small scale pattern. Here's some of the fabrics I considered for the roman blind above the sink. Sean did a fantastic job installing the tumbled moonstone backsplash last year and the blue-grey colour set the direction. I chose the Westgate Ink as the scale worked nicely with the smaller tile, and the fabric picked up on both the blues and greens found throughout the cottage. The fabric has a beautiful woven texture that again juxtaposes against the smooth brick tile. I love fabrics that just make you want to reach out and touch them. In the beginning, I wasn't quite sure which way to go with the cottage design... we're by a lake and a beach so we could have a more coastal theme. But our cottage also sits in a wooded area so a cabiny, rustic cottage look would work too. In the end, the fabrics we've chosen have helped us define a style that's a bit more modern country. With the farms and fields of Prince Edward County surrounding us, that feels just right too. It's a look that says sit and relax, have a nap on the porch and stay for the bbq and roasted marshmallows around the campfire. That suits us just fine. Disclosure: This project was sponsored by Fabricut. Thank you for supporting the brands whose quality products I bring into my own home.